As the market is slowly picking up again more requests for various types of real estate arrive in on our desks every day. We cannot say there are no clients, on the contrary it seems to be a steady stream trickling in as spring gets near. Then how can it be that looking at the average real estate portfolio we see so little movement? Are all these potential buyers just shopping for fun? Without a serious intention to actually purchase their dream? It can hardly be in the prices as those are all visible on line. As are the pictures, property descriptions and features. So what is the underlying problem and our biggest challenge at this time? Going over the requests, visits and feedback our most logical conclusion can only be one. Potential buyers do often not find what they are looking for. And to realize what they are longing to have turns out not always simple nor cheap. Coming mostly from the northern part of Europe and the US they carry with them ideas of living that do not (yet) correspond with the characteristics of the average property for sale in our province. As northern Europe has had a very high standard of living for a long time most buyers think it is only normal to live in a home with large windows, plenty of light and open floor plan where is comes to the living, dining and kitchen area. Spacious bedrooms and, especially for American and Dutch clients one bathroom for each bedroom, preferably en-suite. Low energy consuming houses, with modern features like floor heating, solar panels, heat pumps and design kitchens. Houses with concrete or resin floors, rains showers, built-in lighting, and plenty more features which they come across browsing images on for example pinterest or houzz.com. 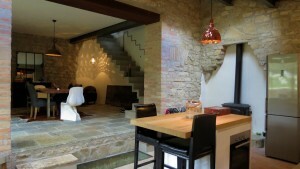 Features that are not commonly found in the typical Umbrian farmhouses. Once we start comparing these wish-lists with the objects for sale the problem is immediately revealed. The new generation of buyers has a hard time finding a perfect match, just as realtors are having a hard time offering one. To really get what you like will for most people mean they better start either building their dream house or renovating a ruin to convert it into the desired residence. Here we face yet again some obstacles. Everyone would like to own that one perfect plot of land. Which is not new, at all. That has been going on for decennia of years, also before modern houses were built, and so the best spots are mostly taken. The land which is still available does not always have the characteristics the buyers would like it to have. The view, location, amount of sq m that can be build and we often have to work with building codes and restrictions which can be quite severe but that do preserve the landscape in a great way. Not every ruin can simply be demolished and rebuild in a different way. The Assisi area for example might impose on those rebuilding the rule that the outside will have to be exactly as is used to be. Builders will have to take pictures, demolish and rebuild according to the image on the photo’s. Some towns require the external to be build in stone, to prevent an invasion of for example “white Ibiza style ” houses. Buyers then tell us they do not even consider spending a large amount to purchase a structurally sound house where they would want to replace at least all bathrooms, the kitchen and floors. But, the sellers do not consider lowering their prices just because their properties are not up to par with the modern requests from foreigners! And so we sometimes get sort of stuck between wish and reality, price and offer, buyer and seller. Luckily we do have great contacts and relations with various builders that can guarantee us a piece of art for every project they start on. And fortunately we have hands on experience with constructions and renovation. Which makes it easier for us to understand what is possible and to offer tailor made solutions to our buyers. Should you like to know more about construction or renovating then please contact us for more information!